Running a small shop is not for the weary. It takes countless hours, energy, passion, and nerves of steel to keep pushing forward when it feels like the cards are stacked against you. Having my shop has given me some of my greatest highs and deepest lows. Self-doubt, pure joy, tears of frustration, and sighs of accomplishment are just a few of the emotions that have made this journey anything but dull. The best part of running my own small business??? Is it the flexible schedule? The fact that I am my own boss? Following a passion? Actually it is none of those..... not even close. What has blessed me most is the other shop owners I have met. There is a bond there, a friendship that can't be touched. It reminds me of growing up in my small town really. My tribe of small business peeps will always have my back. They will be there to pick me up when I have fallen, and they will cheer on my success like a proud parent. I've even had some of these amazing people offer to come help me make product when my health has given me a run for my money. So, to honor some of these incredible people I am doing a small shop feature series. First up is Jake of Two Ravens Soap Company. I met Jake at one of the markets we were both vendors at. Not only does his booth smell absolutely fantastic and I want one of everything, his personality is infectious and will surely leave you smiling. I asked Jake a few questions about him and his shop so you can get to know the maker behind the business. And look at his soap! I mean how gorgeous are those colors?!?! 1. What motivated you to start your shop? I was motivated to start making soap because I was always a fan of craft, natural soaps. I'd always purchase some locally anytime I ran into it, but always was finding more feminine scents. I thought, hey! I'm crafty! I bet I could make some for myself and friends and see how it goes. Knowing I always wanted to be an entrepreneur, and was way-tired of working the corporate management route, I thought about it even further than just a hobby. I started researching equipment, how to officially start a business, web development, etc and before you know it, I was getting into the soap industry. I took a month off from management work, formulated some recipes, ordered equipment and ingredients and got to work! After testing it on friends and family for a few months, I knew I had a good thing going. They kept offering me money well before I was ready to take it and was always given rave reviews. Finally I built my website, found a couple wholesale accounts to start with and officially launched in February of 2014. 2. Where does your inspiration come from? I'm inspired daily by nature and our majestic Rocky Mountains. 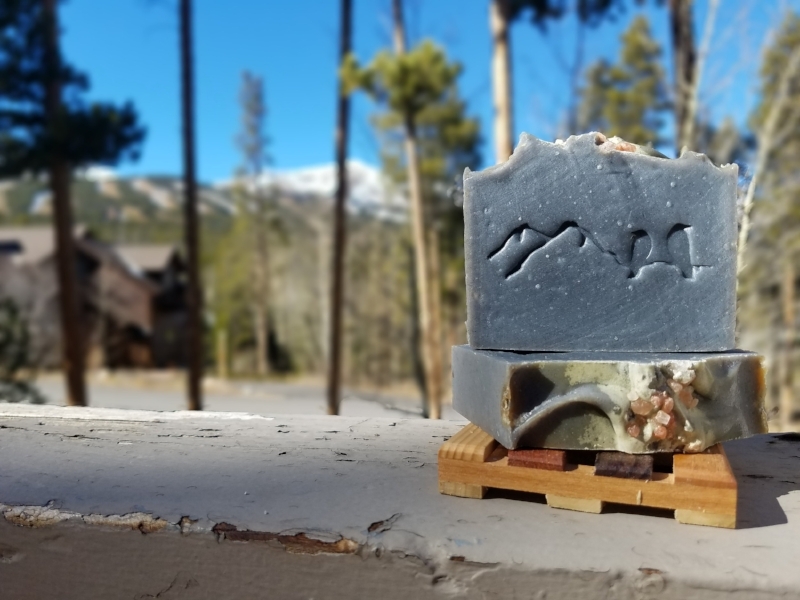 The vibe of Two Ravens Soap Company is taken directly from my Colorado adventures and time spent in our amazing environment. Each product scent combo, style, and look are all meant to take you somewhere on an adventure, all while never having to leave your shower! Although, I totally recommend a quick bath in a high-mountain lake or stream. It totally adds to the vibe. 3. Is there a special meaning behind your shop name? Ravens are the protectors of the mountains. They're there to fly high above us while adventuring and protecting us as we explore nature. Odin, Norse god of wisdom and knowledge, has two ravens that fly about and provide sight and information for him. Huginn and Muninn. Keep an eye to the sky as you take your next adventure, you'll see some ravens flying about. 4. What is your mission with Two Ravens Soap? My mission is to bring people natural soaps and body care products that are environmentally friendly and inspire adventure all while being reasonably priced and approachable by all. 5. Are there any special events you will be attending with your shop? I am a huge outdoor adventurer. Whether it's skiing in the winter, or hiking and camping in the summer, you can always find me doing something outside. The business keeps me busy as well, but that's more fun than it is work to me. 7. Who is someone you consider to be a hero in your life? I look up to my Mom for her strength and courage and ability to get through everything life throws at you. I also look up to my late-Father for his sense of adventure, free spirit and connection to nature and our Native American background. 8. What is a big lesson you have learned on this journey? I've learned to always stick to what your gut says, don't stray from your business plan and path, and to always enjoy doing what you do. Be sure to check out Two Ravens Soap Company amazing products. The smells are divine! You can also follow Jake on Instagram at tworavenssoap and Facebook at TwoRavensSoap.